Yeah, the Kardashian show I’m almost embarrassed to admit I ever watched it. Maybe my libido was involved… all those half-naked women. It doesn't sound crazy at all. It happens a lot to a lot of people. I don't talk about a lot of things even on ATS. Non-experiencers just don't get it untill it happens to them. Then it is all "Oh crap!" In these things, timing is everything and a matter of interpretation. Jung spoke of syncronicities and atributed it to some subconscious process. The new age reinterpreted Jung and turned it into "The Universe" collective mind. But really, it an interaction with individuals who are, in a way and a little bit tongue in cheek PC, physically challenged. The moment was important to someone and perhaps all they could do was break dishes. The most frustrating thing for "them" is that we simply do not listen. There was a case on ATS. A girl's disappearing contraceptives. It was worked out that the girl had a boyfriend and "they" were trying to tell her that he was Mr Right for her, to get pregnant and marry him and live happily ever after. There was a movie, a kid sees dead people and he helps a detective with a muder. That is how it really is. Last night as I was falling asleep, I was violently whacked on the top of the head to the point of almost putting my neck out. She is a dead human girl about seventeen years old. She wants my attention presumably because she is in trouble. I will sort her problems out today. As Sherlock Holmes once declared "The game is afoot." It appears the open public phase of managing magic is about to begin. One of the two camps is about to make an announcement. In days, not weeks, if I am getting the straight goods. Skeptics should now start working up some new lines. He went on to say this will be a scientific announcement that somehow ties in with aliens. What exactly are the two camps? TTSA and Firmage? Yeah, I know the spooky things are real and when they happen we have varying responses depending on one’s disposition. I’ve had many, which I won’t go into here since they're off topic and basically, it's against my principles to go into personal experiences like this. I actually went into this simply because although I'm sure its real its not a big thing. I do believe and we all ought to believe in a phenomenon which isn’t logically explained ironically by the very fact of science and technological advancements. Just imagine going back in time and showing the primitives a radio! As for the experience in question, I actually never sat down and analyzed it simply because if it is a communication to me, at this time I don’t deem it too vital. Shocking. the Mind Boggles Alan. Now then, now then, now then. As it happens... I think its time to chill. This thread is getting a bit sidetracked isn't it? I mean disappearing contraceptives as a signal for marriage? C'mon? looks like the great dragon is coming, a planet that brings fireballs?? more likely a weaponized satellite....... the mind boggles. disappearing contraceptives as a signal for marriage? C'mon? 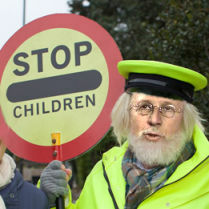 Its very amusing , and the lollipop man looks like Dr Sarfatti.